Rebate increases have only been 2% per year on average over the last 7 years. The Australian Medical Association (AMA) has calculated fee increases by taking into account increases in the Labour Price Index as practitioners have to take into account wage increases in practice staff, increasing insurance costs, and practice operating costs. The AMA fee increases have been about 3.5% each year over the same period. Unfortunately the MBS rebate increase this year is only 1.9%! A recent AMA press release gives further details. For psychiatric attendances there are rebate increases similar to other areas. The usual initial assessment and standard follow up appointment rebates were also only increased by 1.9%. To make matters more difficult for patients there is now a cap to the Extended Medicare Safety Net for certain service items. This means that even if you reach the medicare safety net you may have have to continue paying large gap fees if the fees charged are more than the cap set by the government. As the government has promised a ‘surplus’ and yet it’s revenue has dropped, this year is proving difficult for the government budget. So some of the “tightening of the belt” has once again been passed on to the sick. 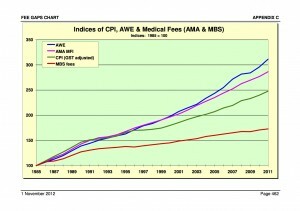 The graph shows the growing disparity between MBS rebates and AMA fees. This will mean that the GAP FEE will continue to grow. As you can see the gap has grown consistently no matter who was in Canberra.